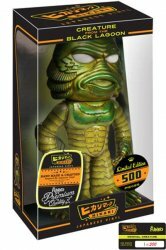 Funko Hikari Sofubi Japanese Vinyl version of the Universal Monsters horror film legend the Creature from the Black Lagoon. This is the Premium Green Secret Base Creature. These sold out at Funko in less than 1 hour! This Universal Monsters classic monster gets the Hikari treatment! 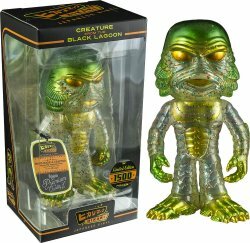 The Creature from the Black Lagoon Green Secret Base Creature Hikari Sofubi Vinyl Figure is a limited edition of only 1,500 pieces. Features a slick shiny-metallic green paint job with clear glittery parts throughout his torso, abdomen, legs, arms, back and face, and comes packaged in a window box for easy display. Figure is approximately 7 1/2 inches tall. Ages 14 and up. Collectors Note: Brand-new and factory sealed Premium figure in larger display box compared to "regular" Wacky Wobbler Bobble-Heads.